Here is a little stroll down memory lane for your viewing pleasure. 2005...Our first Christmas together. We were planning on flying to England together but we lost my pass port and Kev had to go alone. It was so sad. 2006...Clearly we were Floridians in this picture, we look freezing. 2007...This year Kev got a new camera and was in no family photos bc he was busy playing with his new toy...5 days after we took this picture I found out I was pregnant with Libby. 2008....This remains one of my favorite nights in history. 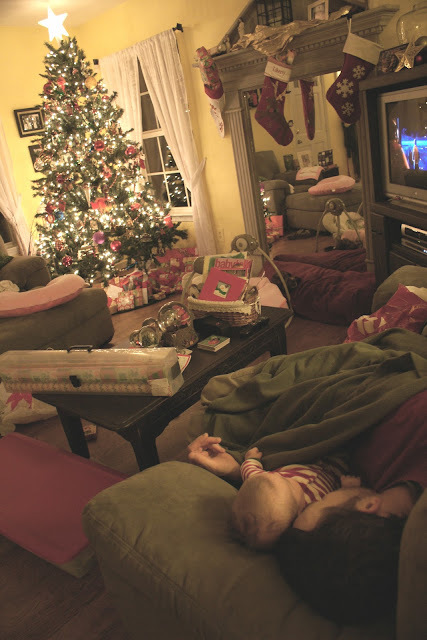 One of my happiest Christmas memories seeing the two people I loved most in the world cuddled together on the couch. 2009...She loved to hug that baby! It was fun to see how much she loved opening presents this year. 2010...I call this Christmas, "the long wait for Maggie"
Cards are in the mail, you should get them delivered by Boxing Day. Does Kevin agree with the comment "we lost my passport"? Love your reminders of Christmas past though.